Nor at the Blue-banded B&B. You could be mistaken for reading the title and thinking that Xmas is upon us, but no. There has been action though at the Blue-banded B&B. As previously reported the Blue-banded Bees and their parasitic entourage have long left. 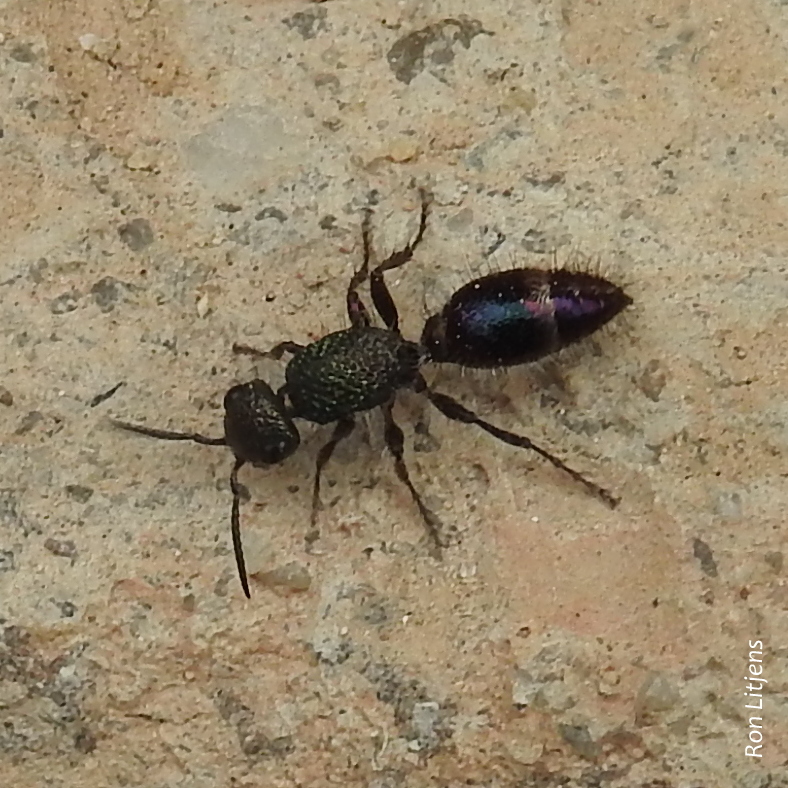 Similarly the Cuckoo Wasps and Mud Wasps are no longer hanging around the building. 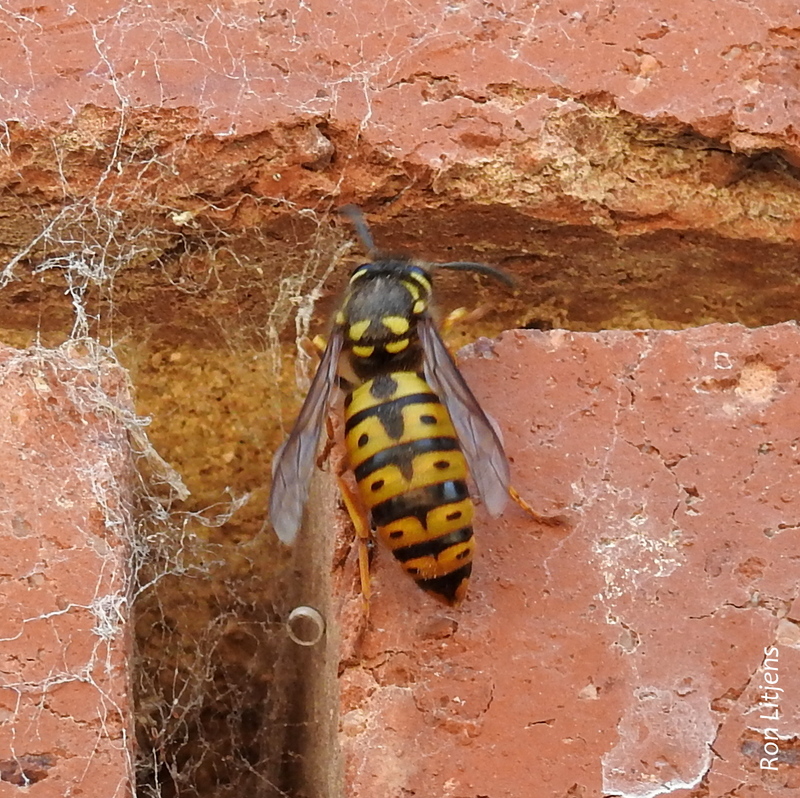 The recent arrival as of last week has been a European Wasp of the queen variety. European Wasps (Vespula germanica) are a highly invasive wasp species known to drive native insect species out of an area and create havoc with outdoor human activities over the summer period. In the past couple of years the problem has not been as bad due in part to late spring rains flooding nests along the local waterways. Nests are started in spring when a fertilised queen lays eggs in a number of cells, usually underground. These eggs hatch into workers who over summer continue to expand the nest. Over this period the queen wasp lays thousands of eggs which mature into workers, drones and new queens. In autumn the newly hatched queen wasps emerge from the nest and search for a place to overwinter. Common places are wood-piles, holes in the ground- either found or created, and cracks in the brickwork of old buildings. 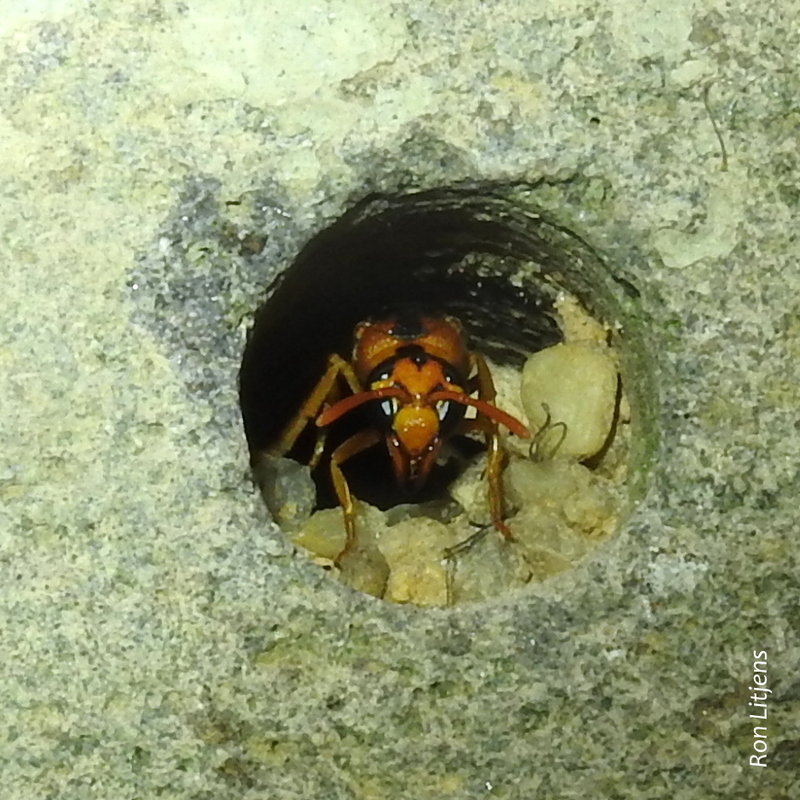 In their native Europe and the Middle East populations of European Wasps are controlled by the climate with very cold weather killing many nests. 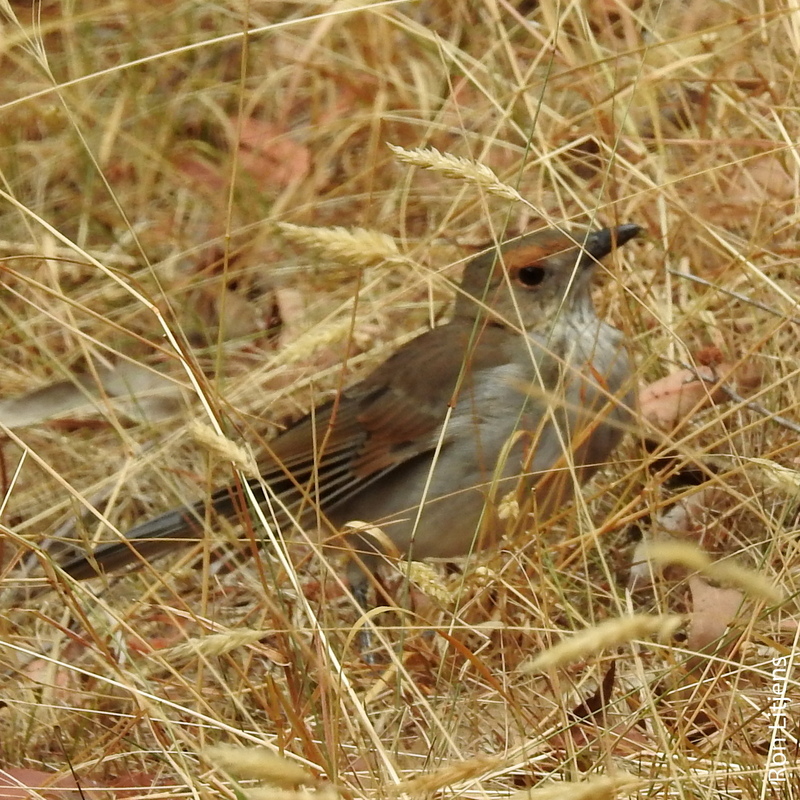 However in the more temperate Australia, nests survive the winter and continue to grow. Apparently there were no cracks in the building suitable for the new arrival. I do not want to appear racist but as far as wasps are concerned, Europeans are not welcome at the Blue-banded B&B. 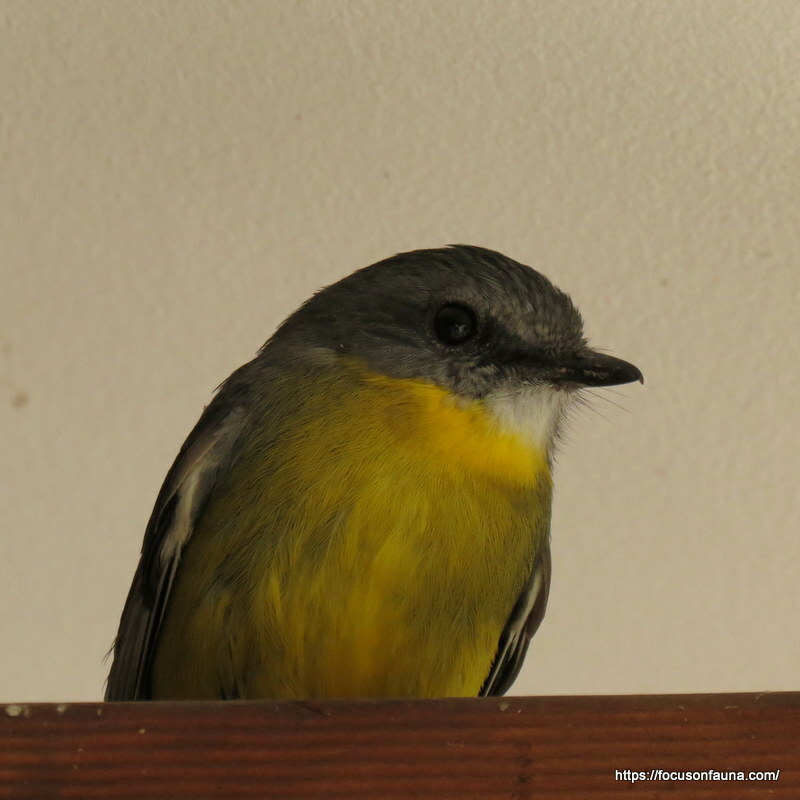 On hearing a kerfuffle at the back door, we looked out to see a plump yellow and grey bird fluttering and then landing on a beam under the eaves. 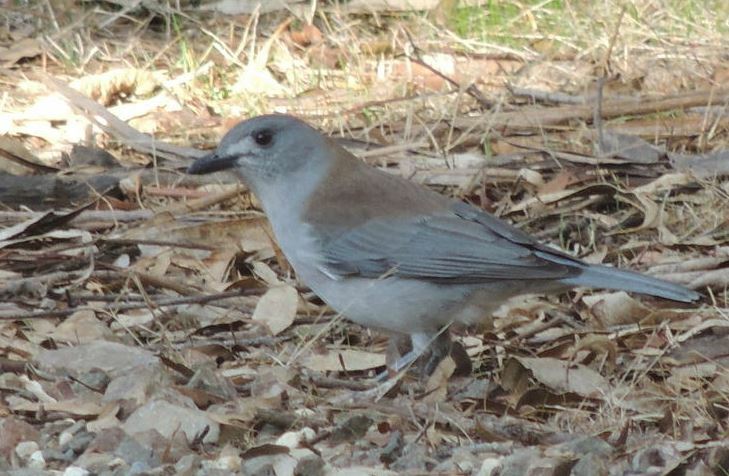 It was an Eastern Yellow Robin which seemed distressed and confused, perhaps having been chased by another bird: currawong, butcherbird or even our often-seen brown goshawk – who knows? After about 15 minutes, it had settled down enough to fly off, but in the meantime, we had a chance to have a close look at this lovely little bird. 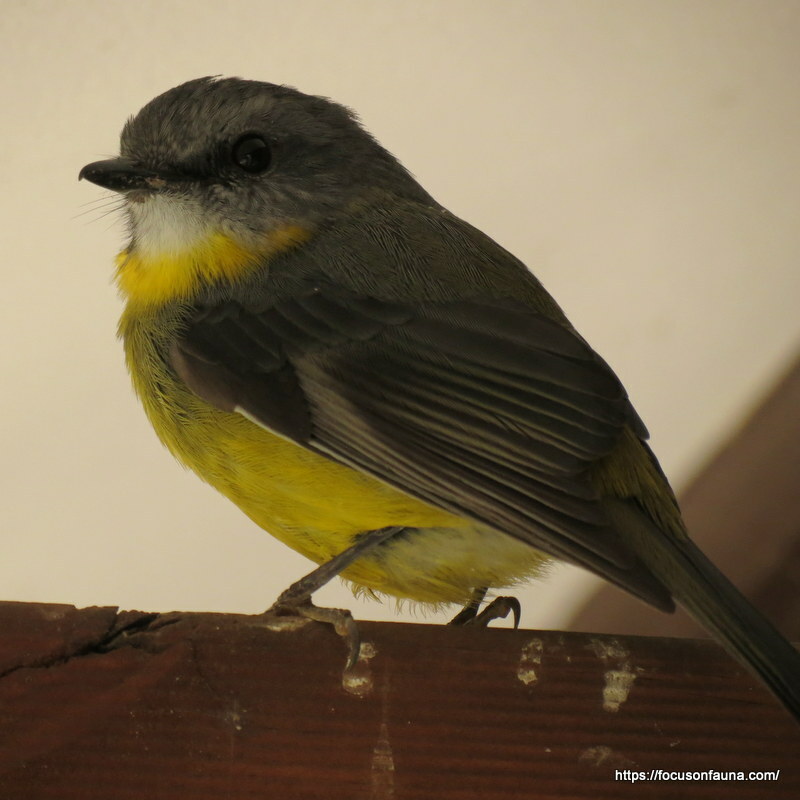 The Eastern Yellow Robin is mostly sedentary and can be seen or heard occasionally, all year round, in native vegetation remnants, roadsides, creeklines and even gardens in the King Parrot catchment. Both sexes emit a persistent piping call, sometimes in lengthy bursts. 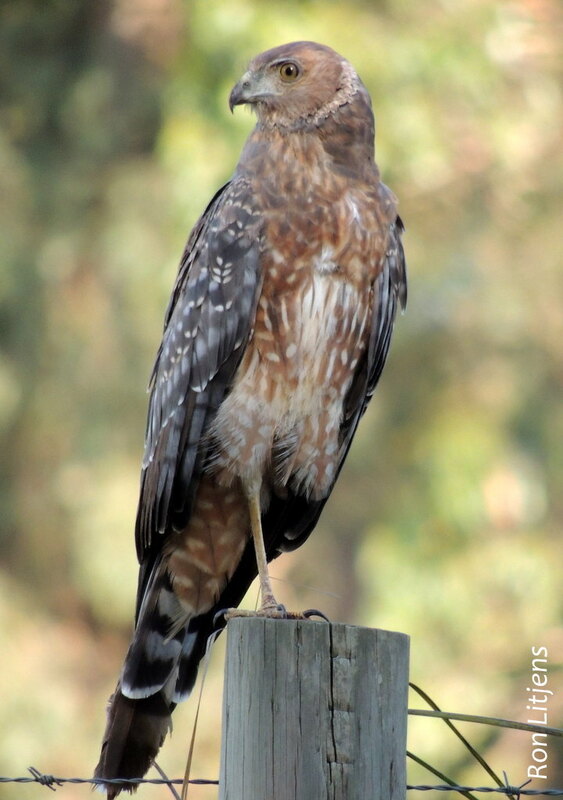 The male also gives a loud two- or three-note territorial call. Both calls can be heard by clicking on the audio bar below. 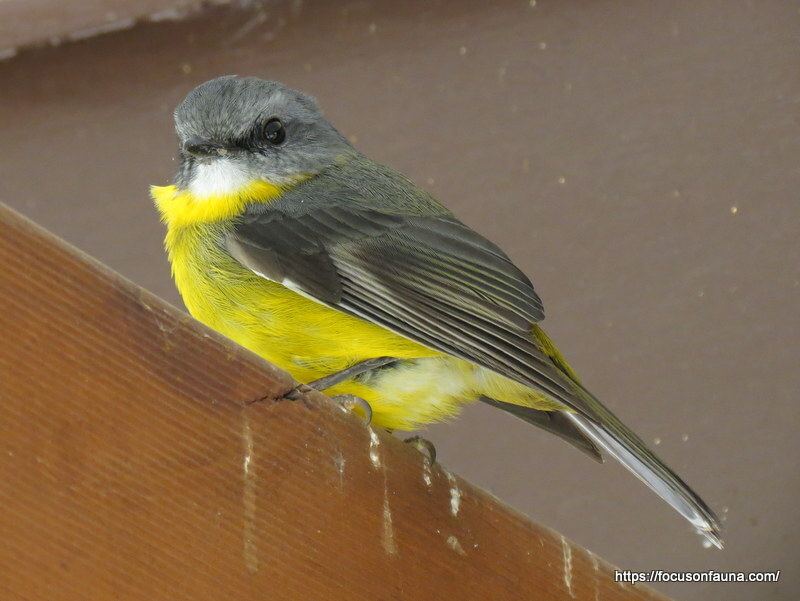 Birds like this robin must be doing it tough in this extended extremely dry period, with food sources depleted. So here’s hoping for a break in the weather soon! 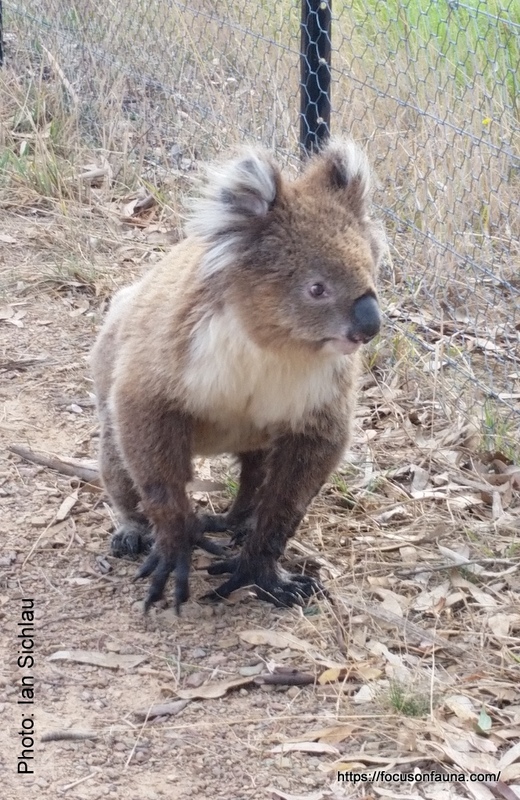 We couldn’t resist posting this fine picture of a Koala (Phascolarctos cinereus) that was sent to us by Ian from the Yellow Creek Dairy Creek Landcare Group. The koala sauntered past Ian as he was fencing on his property near Yea. 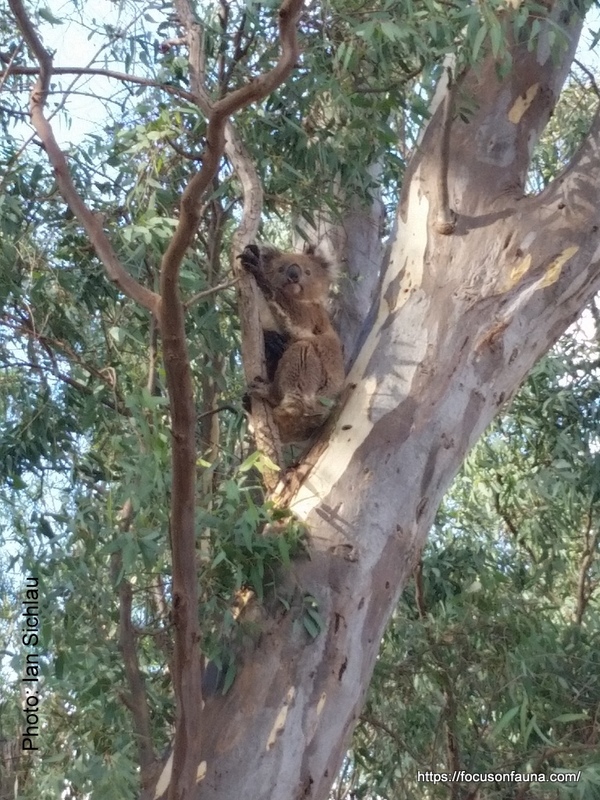 Koalas are a relatively rare occurrence in our district. 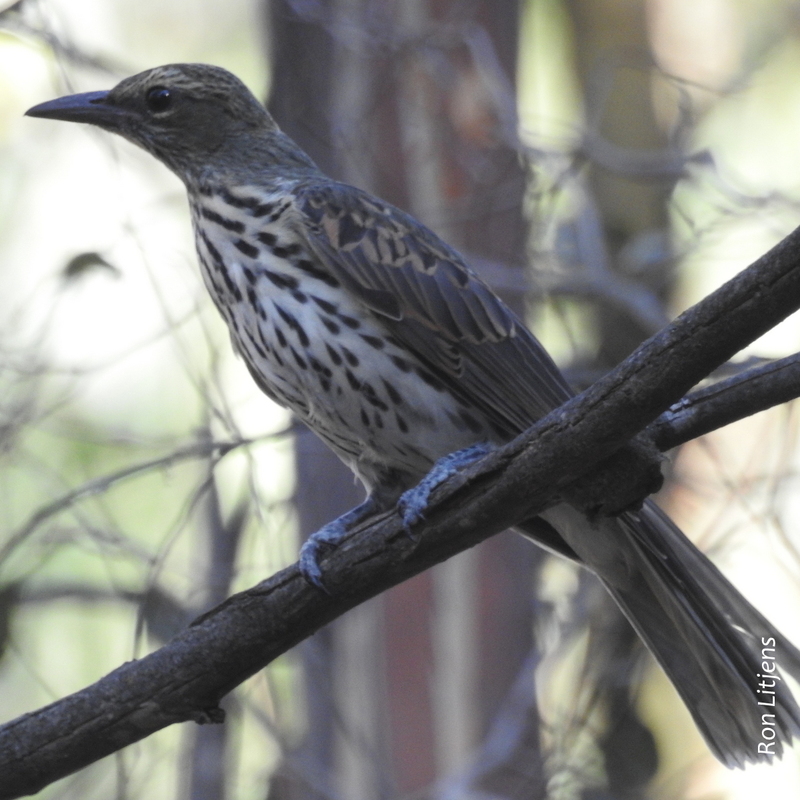 There have been only 9 recorded since 2000 on the Victorian Biodiversity Atlas data base within a 15 km radius of Ian’s property – an area that includes Flowerdale and Strath Creek. A few of the sightings have been animals translocated from French Island to Mt. Disappointment Forest in 2004. It is interesting to ponder the ancestry of koalas. They are quite agile (though vulnerable) on the ground and are not at first sight obviously adapted for arboreal existence: dumpy, no prehensile tail (or any tail to speak of! ), no gliding membranes and relatively small forward-facing eyes not particularly suited to night-time manoeuvring among branches. To compensate for these deficiencies they do of course have powerful hands and feet with long sharp claws. So what are the roots of this unique creature? Apparently the fossil records provide very little information about the origins of koalas and their relationship to other marsupials. Comparisons with the characteristics of living marsupials offer the best clues, and it turns out that koalas share many features with wombats, such as a rudimentary tail, a backward-opening pouch with only two teats, granulated rather than ridged pads on the hands and feet, cheek pouches, a unique gastric gland – and they even have similar hook-shaped sperm quite different from those of other marsupials. All these mutual characteristics led biologists to deduce that the koala shared a common ancestor with the wombat. Furthermore, that ancestor was almost certainly terrestrial (ground-dwelling) – more wombat than koala! Those who read this blog regularly will know that the Order of insects known as Hemiptera, insects with sucking mouthparts, feature regularly. We have featured cicadas, shield bugs, gumtree hoppers and psyllids. Another common but rarely noticed Hemipteran is the scale insect. Scale insects are parasites of plants sucking their sap. The female is wingless and usually immobile, attaching itself onto a plant and then secreting a wax covering to protect itself. A common scale insect locally is the Gum-tree Scale (Eriococcus coriaceus), recognised by their housings, groups of white sacs on eucalyptus twigs and branches (see below). The sac is the house of an adult female scale insect. The insect itself has its mouthparts attached to the plant and the opening at the top of the sac is blocked by its abdomen. A by-product of feeding, as with many Hemipterans, is a sugar-rich substance called honeydew. This is extruded from the hole in the top of the sac (see picture above). Scale insects have developed a symbiotic relationship with ants which collect the honeydew as a food source in return for protection from predators and parasites. After each moulting both male and female scale insect instars find new positions on the plant and construct new wax sacs. After the final moulting the adult female insect constructs the final sac which takes up to two weeks. During this time the female is fertilised. Several hundred eggs are laid in the sac and when hatched the resultant nymphs emerge from the hole in the sac and crawl or are blown to other plant locations or plants to which they attached themselves. Adult male scale insects do not have mouthparts with which to feed nor do they construct wax sacs. Their sole purpose is to mate with females, after which they die. This occurs over a few days. 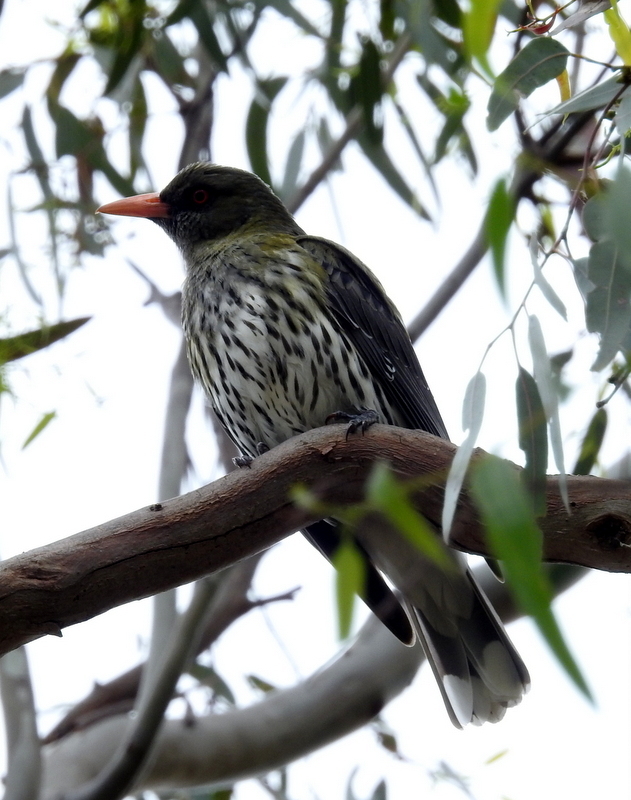 Natural predators include birds such as Blackbirds and Silvereyes, the caterpillars of some moths and the adult and larval forms of Ladybird Beetles. On balance, scale insects are quite interesting. tags: Mantis Parasitic Wasp, Podagrion sp. An ovipositor is a structure used by some animals to lays eggs. For insects it is situated at the end of the abdomen, see picture left. The organ can be highly modified. In sawflies the ovipositor has been modified as a saw-like tool to slice open leaves into which eggs are laid. In grasshoppers and crickets the ovipositor acts as a shovel to dig holes in the ground. The eggs are then laid in the resulting chamber. The ovipositor in many hymenopterans (ants, bees and wasps) has been modified for stinging or piercing, many having associated venom glands. Parasitic wasps in particular use the ovipositor to drill into a substrate so as to be able to deposit eggs directly on the host body. Marie on Junction Hill has been carefully watching a praying mantis egg-case (known as an ootheca, see picture right) that has been deposited on a plant outside the kitchen window, waiting for the moment in which the young mantises emerge. 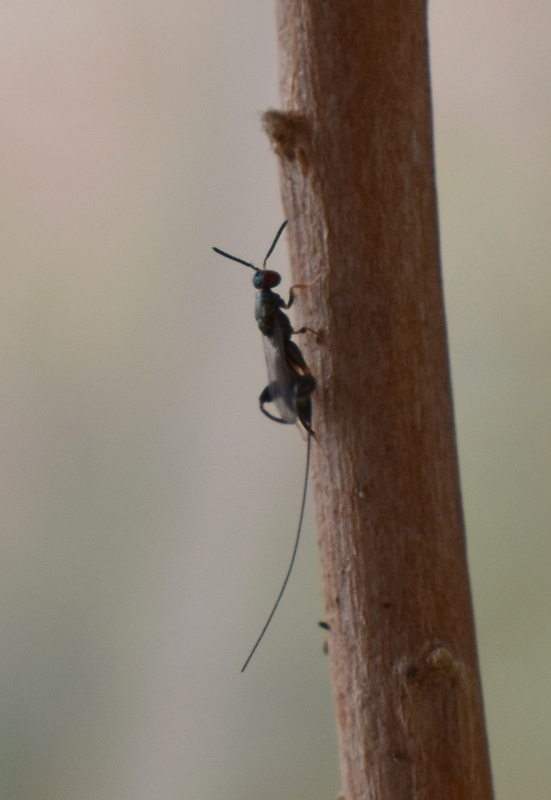 Recently however a Mantis Parasitic Wasp (Podagrion sp.) 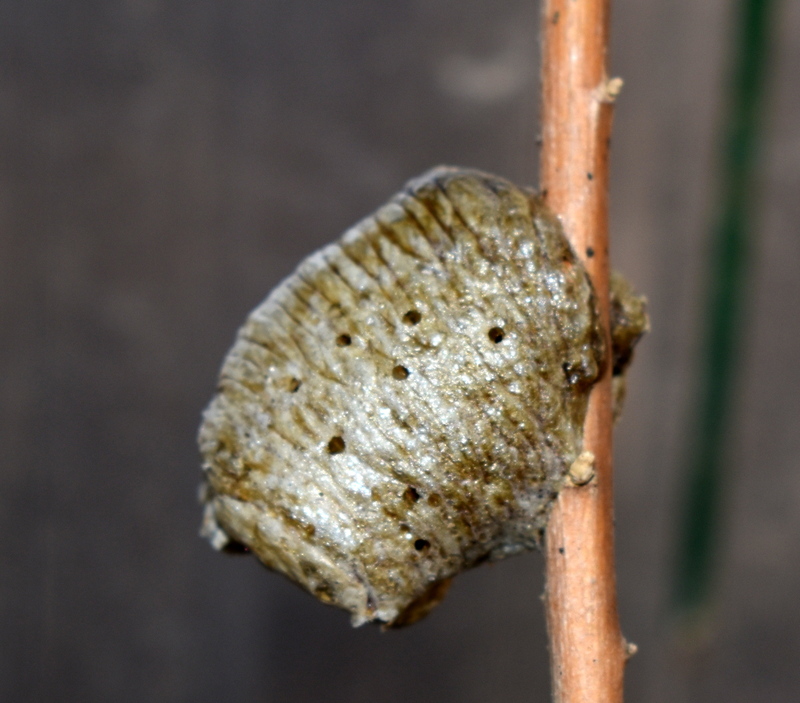 has been loitering about the ootheca, see photo below. The word Podagrion is derived from the Greek podagra meaning gout, referring to the wasp’s swollen hind legs (see pictured above). 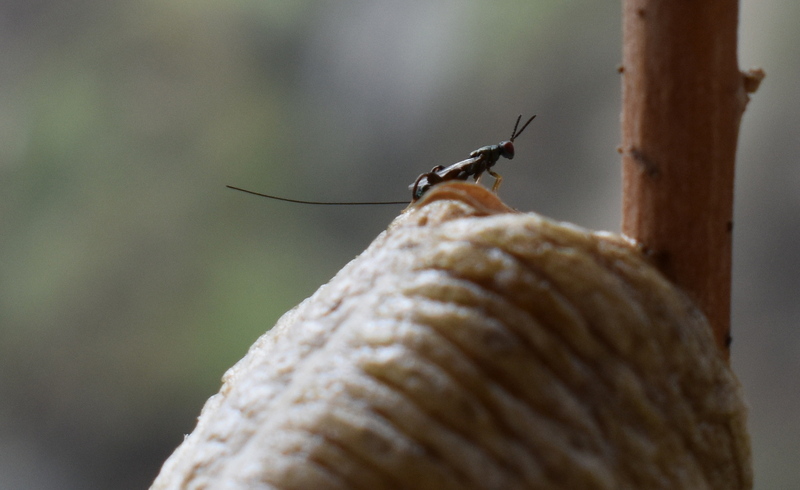 Using the ovipositor as a drill the female wasp pushes it into the egg-case and deposits its eggs onto the eggs of the praying mantis. When the wasp eggs hatch they eat the mantis eggs. The holes in the side of the ootheca indicate some young wasps have already emerged. Depending on the species an ootheca can contain up to several hundred eggs. Hopefully Marie still has a chance of photographing some of the baby mantises hatching.